I just got in from taking the girls on a 45 minute walk. It is 57 degrees here this afternoon and it was a wonderful walk. I get a kick out of little Angel (Garland). She stands on the couch looking out the window...just crying to go outside. She loves her walks!!! We had snow here last weekend (hard to believe today!) so we couldn't go outside for 3 days. It was hard on Angel. She couldn't understand why we couldn't go out for very long. She and Tasha just had to wrestle and play inside with toys. Angel is really good at fetching and tugging. We have such a good time. My daughter was amazed a couple of weeks ago when she took Angel and Tasha outside. She couldn't believe how well Angel heels. Someone must have trained Angel at some point.... or else she is crazy about those treats she gets when she comes in...and when she goes out!!! Angel loves her walks (3-4 a day!) Sometimes she looks out the bay window from the couch and just whines to go outside. We had so much snow for a week that I couldn't take her for her 3-4 walks. I had shoveled just a small spot for her and Tasha to do their duty. No play area!! All our playing was done inside for a few days. But the girls looks so cute all bundled. I thought you might like to see how pretty she looks in her sweet she is. 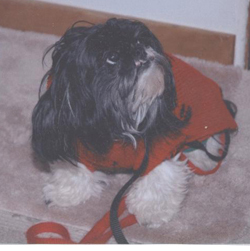 Copyright© 2004 - 2006, Peke A Tzu Rescue. All Rights Reserved.